“It is the aim of this painting of Sydney artist Kerrie Lester not only to reveal something of the sitter that a photograph or casual meeting might not, but to create an historically informed portrait within a contemporary cultural context,” says Rodney Pople. “The painting takes its inspiration from Goya’s famous portrayal of the Duchess of Alba (1797). 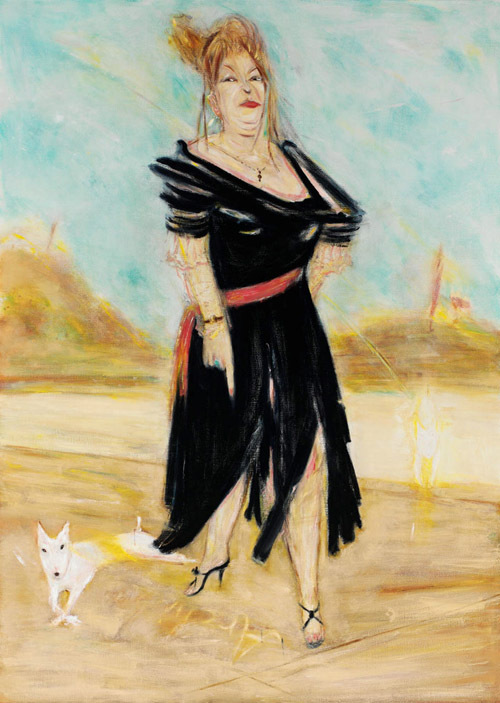 While the scale and formal aspects of the painting echo the original, anecdotal details locate this painting in the here and now: the subject’s dress has been adapted to echo more recent fashion, the landscape she stands within is based on her local Balmoral Beach, and the dogs are Lester’s cherished canine companions. Pople has known Lester and admired her work for many years. “Although our painting practice has little in common either formally or conceptually, in the context of the Archibald Prize we share an interest in contesting the traditional parameters of portrait painting while remaining firmly within its art historical lineage,” he says. “The Archibald Prize is of particular importance to Kerrie Lester, who has been selected for the exhibition almost every year since she first submitted a painting in 1988. This is discreetly referred to in this painting. Goya’s portrait had a cryptic element (writing in the sand) alluding to the sitter’s feelings towards the artist. Born in Launceston in 1952, Pople gained a Diploma of Fine Arts (Photography) at the Tasmanian School of Art and undertook postgraduate studies in sculpture at the Slade School of Art, London and the New York Studio School. He has been exhibiting annually since 1978 and has had regular solo shows at the Australian Galleries in Sydney. His work is represented in many major collections including the National Gallery of Australia, the National Gallery of Victoria and the Queensland Gallery, amongst others. This is Pople’s fourth time as an Archibald finalist.